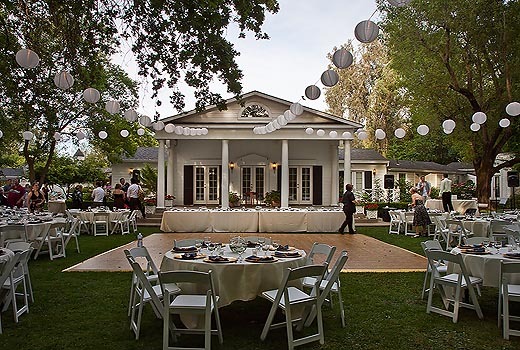 Wedding and Party DJ for Sacramento, Redding, Chico, Wine Country and Everywhere in Between! One of the most beautiful venues in all of Shasta County. The White House in Redding has only recently opened it’s doors to events. It has quickly become one of the best choices for wedding venues. There are so many great things to talk about with the white house. I like the fact that it’s very easy for caterers, DJ’s and other services to setup. But that should be the least of your concern. Lets talk about the sheer beauty of the place. It is a beautiful colonial style house hidden from view of non wedding goers thanks to a barrier of high trees surrounding the house. The trees also create full shade by mid afternoon so you do not need to rent tents. Let’s talk about the value! Well, it’s a beautiful venue. I have been to many events far more expensive with less beauty surrounding, and even less offerings. In addition to beautiful scenery, The White House in Redding has high quality seating for over 200 guests. They have a permanent dance floor and they have beautiful decorations already in place. You could literally not spend any money on decorations and this place would still be spectacular. They also provide 2 bartenders and 2 bars. As well as help with setting up dinner tables and seating. There are only a couple of small drawbacks to planning your wedding at the White House in Redding. The first is that their liquor license does not allow hard alcohol, so if it is extremely important for you that everyone is drinking cocktails, this is not the place. The additional drawback is that you are required to serve only their beer from there bars, manned by their bartenders. This is understandable, as many places have this requirement, and their prices are not unreasonable. However it does mean that you are limited to what they provide. You are allowed to bring your own wine, with a per-bottle corkage fee. You are also allowed to bring your own champagne, which they do not charge corkage on. One other drawback to consider is that music must be off by 10pm and you must be completely packed up and out of the place by 11pm. This is probably not a problem as long as you start your wedding by 5pm or so, as a 5-6 hour wedding is typically the sweetspot. The drawbacks are minor in comparison to how beautiful of place this is to get married at. If any of my clients ask me for a good place in Redding, this is one of the first that comes to mind. The best party or wedding DJ in Sacramento, Redding, Chico and Sonoma! Copyright © 2013 Wedding and Party DJ Services by Mike Flanagan - Sacramento, Redding, Chico, Deejay, Planning and Emceeing.